How Does the Creation of Jobs, As Opposed to the Loss of Jobs, Affect Your UI Tax Rates? In June the number of full-time jobs in the United States finally got back to the same level as the beginning of 2008. It has taken a long time. Since full-time jobs are now back to ground zero and increasing, this is a good time to consider how job creation impacts your exposure to UI taxes. The immediate first year result of your company creating a job is an increase in your UI taxes because of the increase in taxable payroll. In all states except four (NH, NJ, TN, VT) UI tax rates are assigned for a calendar year, so any new hires this year could not affect your UI tax rate calculation until 2015 at the earliest. However, the computation date for 2015 tax rates is June 30 in most states, in which case new hires in the second half of the year will not influence your tax rate until 2016. In reserve ratio states, the second year impact of creating a job can also be adverse. A reserve ratio is simply a company’s reserve account balance divided by a measure of its taxable payroll. A higher reserve account balance, in relation to payroll, results in a lower tax rate. For a company with a positive reserve account balance creating a job often dilutes the reserve ratio (the reserve account balance grows at a slower pace than the taxable payroll). This can keep the tax rate elevated for an extended period when a company is growing rapidly because the increased taxable payroll makes your reserve ratio a smaller fraction (assuming you have a positive reserve account balance). Attached is a list of reserve ratio states. The reverse is true in benefit ratio states and benefit wage ratio states. A benefit ratio is a measure of benefit charges resulting from approved claims (usually three to five years of charges) divided by a measure of taxable payroll for the same time period. Creation of jobs translates into a smaller, more favorable benefit ratio or benefit wage ratio, because taxable payroll is the denominator of the ratio, and a lower UI tax rate is assigned, all other factors remaining unchanged. UI tax rates in benefit ratio states and benefit wage ratio states generally respond more quickly (for better or for worse) to changes in taxable payroll. Attached is a list of benefit ratio states and benefit wage ratio states. Regardless of the state, your company will benefit from other companies creating jobs as well. As jobs are created, UI claimants are able to find a new job sooner, and the average duration of a UI claim decreases. Your UI benefit charges will be reduced when another company hires your former employee sooner. 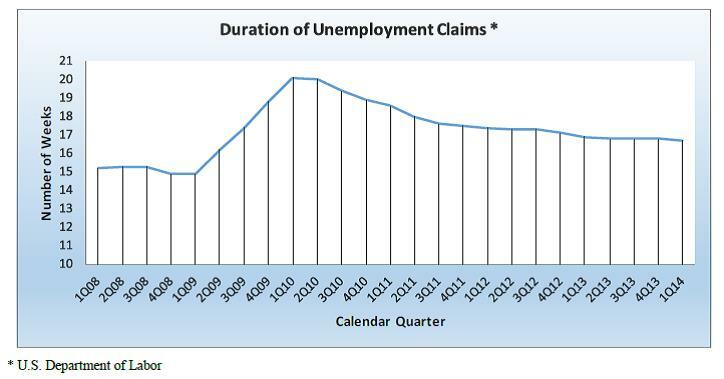 The average duration of a UI claim peaked at 20.1 weeks in the first quarter of 2010. The duration has decreased for sixteen straight quarters, to 16.7 weeks for the first quarter of 2014 (a 16.9% reduction in duration). This means that your benefit charges (on average) are more likely to be reduced, even if your company experiences the same number of unemployment claims. SUI tax rates in most states remain elevated today. However, the state unemployment trust funds are growing, in part because of the increased revenue generated by elevated tax rates. As more jobs are created, the elevated tax rates are applied to more taxable payroll, thereby accelerating the improvement in trust fund solvency (at your expense, of course). 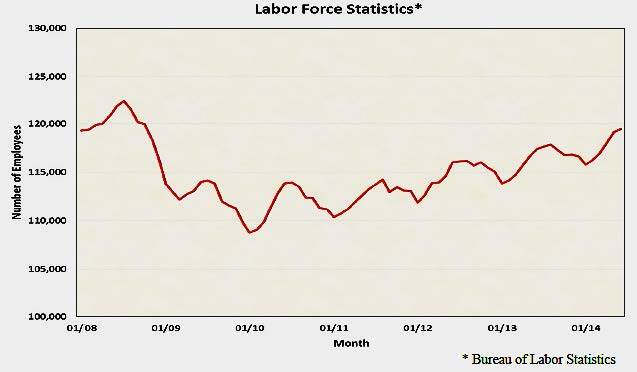 It is our expectation that the slow but relentless upward slope of the jobs graph will finally begin to have a more noticeable impact on tax rates next year. Simultaneously, the decrease in the duration of claims and the reduction in the number of claims as the labor market improves are slowing the drawdown from state trust funds. The combination of these tailwinds causes us to be optimistic about 2015 UI tax rates for most states – particularly the benefit ratio and benefit-wage ratio states. California is a notable exception. Barring any unanticipated legislation, we see no near-term UI tax relief for California employers. Click the link to view the recent blog: Enforcement of Employer’s Responsibility for UI Program Integrity or check back for more on human resources, payroll, insurance and benefits specifically for nonprofits. This entry was posted in In the News, Solutions and tagged full time jobs, reserve ratio, tax rate. Bookmark the permalink.